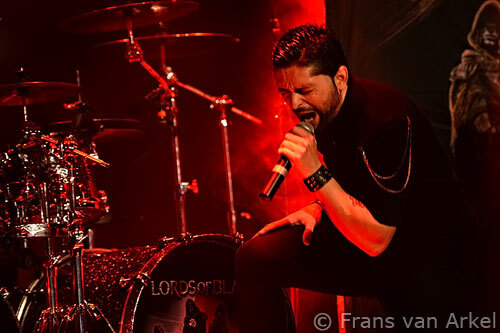 Lords of Black did two shows in the Netherlands. The second concert is up north in Hoorn. The venue is called Manifesto. It is a nice and cozy place, typical a venue where you can expect the better local Dutch bands. As you often see in such places it is packed or very quiet. Today it looks like it is not going too busy. And unfortunately these thoughts became reality. Only about some 50 people turned up tonight. The support act is Savage Machine. This band comes from Denmark and is the support act on the continent. In the UK there will be another band called Fury supporting Lords of Black. 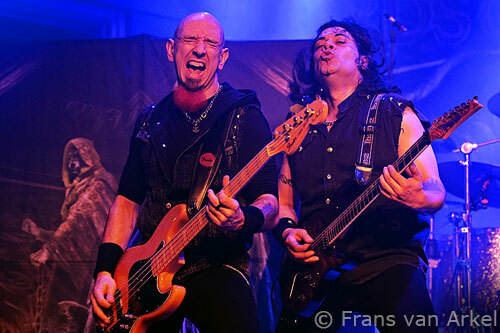 The Danish guys do tonight their 4th show after the gigs in Verviers (Belgium), Siegburg (Germany) and Zoetermeer (The Netherlands). Afterwards singer Troels Rasmussen told me they were going back home after this show. But they'll return on December 15th and do three more shows in Germany and Switzerland. They did a nice show. Their sound is close to Iron Maiden and Judas Priest. Real heavy metal with two good guitar players and a typical heavy metal singer. The small crowd enjoy their show from a little distance. At 22.30 the Lords of Black kick off their show after the intro with 'Merciless'. Ofcourse the eyes of the crowd are pointed in the first place at Ronnie Romero. The new voice of Rainbow impress everyone right away. Then there's the bassist Javier Garcia. Great bassplayer, superb showman with his funny red goatee. What a guy! The drummer Andy C hits and kicks his drum kit like crazy. He's a real hardrock drummer. Ritchie Blackmore should check these two guys out as well because they rock like hell. And then there's Tony Hernando. Obvious a very experienced guitar player. He's the main man of Lords of Black since he wrote most of their songs. He knows how to handle his six string axe very well and is an excellent showman as well. 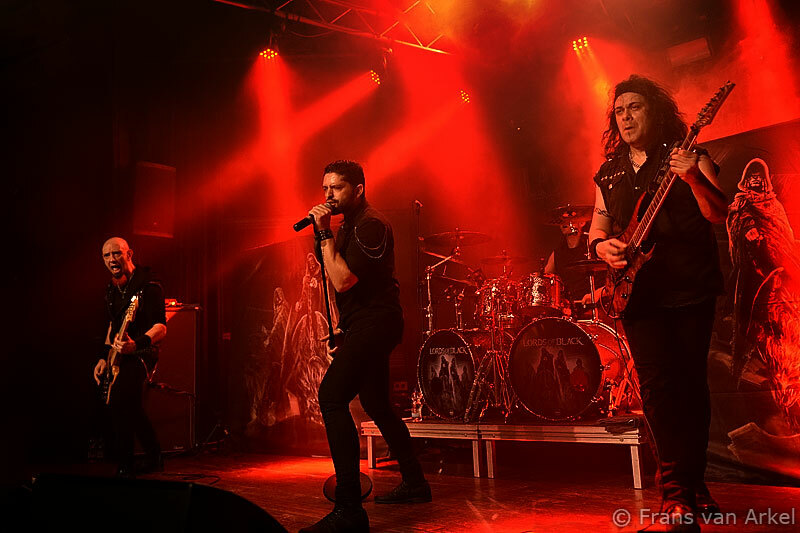 Lords of Black do songs of both their first and second album. And they rock. Don't expect anything too much like Rainbow. These Spanish metallers play pure power metal, so they are much heavier. But they are great and the audience enjoys every minute of the show. Even though the crowd is very small Lords of Black play at full strength. Their songs are pretty strong and enjoyable once you get used to their music that is quite different than our beloved Rainbow sound. But Ronnie excels and so does the other three members of Lords of Black. The band plays for some 70 minutes and play some very strong material from both their albums. The one I like best is the dedicated to and inspired by Phil Lynott song called 'Cry No More'. An excellent track written by Tony Hernando that sounds like the old Thin Lizzy days. It also comes close to bands like Rainbow and Whitesnake. Just a superb track. Despite the small audience they return for an encore. First they give us the long but excellent 'When Everything Is Gone'. But the night is not complete with a grand finale. That one is tonight 'Neon Knight', one of the brilliant tracks from the Black Sabbath era when Ronnie James Dio was their singer. And Ronnie Romero sings it very well again. Just after midnight the show is over.